Unusual Carp Fishing Baits And Tactics For Big Fish! For example, it is often the case that anglers will feed free ground bait of very numerous descriptions and that carp get used to eating all this free food with great confidence while also being able to discern the baits and rigs you are fishing with. Sometimes this is such an evolved skill and art the fish have it almost seems beyond logical explanation! It is very easy to achieve significant edges by bait manipulation while using very simple rigs indeed. There are so many ways to do this that the starting point really has to be to notice what baits and rigs are most commonly employed on your water. 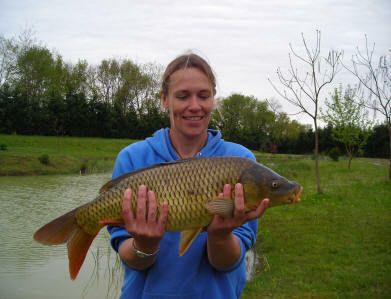 Consider how these might be potentially educating your carp into what to avoid or how to deal with such threats when presented to them day in day out in their search for safe food and you might well start thinking more like a carp. Thinking like a carp instead of like an angler is a very good edge which is very much over-looked by the majority of carp anglers. An instant example of turning the impact of usual angling practices into results is by using unusual line angles from your rods to your baits. This can simply fool the fish that there are no dangerous lines present in the swim so their suspicion level towards your hook baits is reduced compared to normal which can obviously raise your chances of a take. Everyone knows about the advantages of fishing slack lines and small leads as opposed to tight lines with heavy fixed or semi-fixed leads where fish have wised-up and use the heavy lead as a fulcrum to spit hooks with ease; often giving you no indication of what just happened. But you could well try using safe back-stops or utilising flying back leads strategically to alter the usual tensions on your line; not giving enough pressure for a fulcrum effect, but enough to initially hook fish a little deeper, or at least show some line indication of a bite occurring for instance. It is easy to use the modern bite indicators which swing on the line in a virtually un-weighted mode in order to find fish patrol routes and feeding times etc, by using line bites far more purposely as extremely valuable time-saving feedback information. Using more advanced lines which do not reflect light can induce far more line bites than the most commonly used monofilament and braided lines fish are used to detecting. Just to illustrate a point, in the second world war it was said that it took a spitfire pilot at least 10 sorties to get his eye in just to spot the enemy planes closing in before he got much too close to respond instead of simply react. All these pilots would see is a black dot that might only look like a speck of dust on his glass canopy. But when this speck became a full size enemy fighter pouring bullets at your plane within seconds, the majority of pilots who survived their first missions adapted their vision pretty quickly! Carp can often see pretty much all our rig materials if water particles density, daytime weather angle of the sun in the sky and depth of light penetration allow. Carp vision of our tackle is obviously a great deciding factor in getting bites or not and yet this issue is not as clear as it seems. It may be that carp detect plastic coated leads more easily than if lead with an uncoated dull grey lead colour in water, maybe due to less reflected light and its connotations, or perhaps by less emissions of small electrical charges made by the various hooks, leads, swivels, rings etc which are commonly used, and which fish can detect. Sometimes it is easier to catch carp on a single or half a bait, but there are also those times when a combination of baits on the rig is more productive. It is one of those things that even sea anglers notice. One day the fish will bite at a big bunch of 3 black lugworms and are very easily caught. But the very next day only using single lugworms on the hook produces bites. Fish adapt and change constantly to changing external conditions and also to something far less obvious to us anglers, to their changing internal conditions. These all might impact upon each other in fish or just individually to impact upon fish behaviours and the challenges you are faced with and not even one day or night is ever the same as the previous one due to many variable factors which make fishing so fascinating and also frustratingly puzzling and complex at times! But for those willing to make and use baits differently to the currently fashionable, and even combine them on a rig with black foam or cotton wool soaked in feeding stimulants. Even humble flavoured bread flake with flavour sprayed corn or maize or worms for example provides differences that can easily produce big rewards. How many big carp anglers use a soft pellet in a soft paste wrap surrounded by washed-out boilies as free feed? This fishing bait secrets ebooks author has many more fishing and bait edges - just one could impact very significantly on your catches!